Bond Lifestyle is proud to present an exclusive offer that will make the best Bond Girl gift even better. Buy the stunning Algerian Loveknot necklace from Sophie Harley and receive two complimentary love letters (without diamond) of your choice. If you can solve the secret code below, you can also enter in the draw for a pair of Sophie Harley Bond Leaf earrings. The Algerian Loveknot necklace was designed by Sophie Harley for the movie Casino Royale and is worn by Eva Green throughout the movie and is also briefly seen in Quantum of Solace. The necklace is available on SophieHarley.com, get it here. 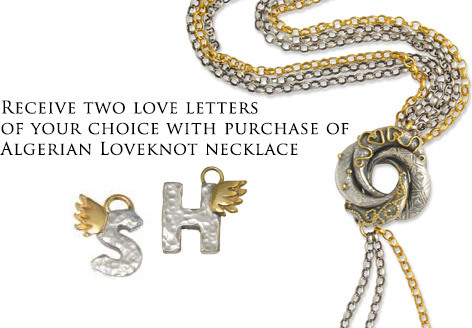 The Love Letters are hand-made winged letters, available with and without diamonds, and are made of silver and gold plate. Combine them to spell a name or initials. Available on SophieHarley.com. 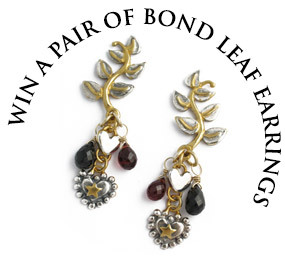 The leaf earrings with hearts and garnet briolette stones were designed for the movie Casino Royale and are worn by Eva Green. The earrings are 50mm long, silver and 22ct gold plate. Available on SophieHarley.com. 1. When you purchase the original Sophie Harley Algerian Loveknot on SophieHarley.com, fill in the coupon code bondlifestyle. 2. In the 'special requirements box' state which two love letters you would like to receieve (any two letters from the alphabet). 3. 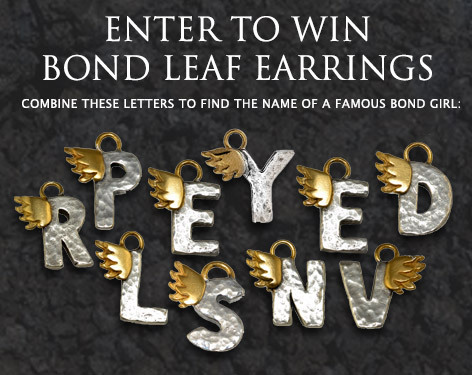 To be entered in the draw for the Bond Leaf Earrings, find out which Bond Girl name can be made with the letters in the image below. Enter the name of the Bond Girl in the special requirements box when you purchase the Algerian Loveknot necklace. The winner of the earrings will be selected at random and announced in December 2014. Enter until December 1st, 2014.
hey guys, do you know if there are any upcoming specials for the algerian knot necklace?